Caroline Sandin graduated from County Teacher’s College in St. Peter, Minnesota, and then made her home in Ashland, Wisconsin, where she and her husband raised seven children. She was active in her church, Girl Scouts, Cub Scouts, PTA, and the Chequamegon Bay Civic Music Association. 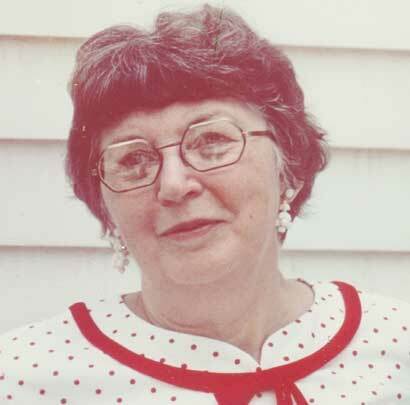 In 1954, she helped start the League of Women Voters of Ashland and was its first president. She was elected to the local school board in 1961 and served for 21 years, many of them as president. Sandin was appointed to the Board of Regents for the UW System in 1968 — the first woman Regent since 1954 — and served for nine years. In that position she was a strong proponent both for women’s rights and for the disadvantaged. She was elected to Ashland County’s board in 1978 and served for 18 years, during which time she was also elected to and served on Ashland’s city council. She was named Ashland’s Woman of the Year in 1979 and Ashland’s Outstanding Citizen of the Year in 1984. After her term as UW System Regent, Sandin served on countless boards and commissions, including the board of visitors for both the UW-Eau Claire and the UW-Superior, the Governor’s Conference for the Status of Women, and the Wisconsin Supreme Court’s Board of Attorneys’ Professional Responsibility. She also sat on her church council and on the advisory council for Lutheran Social Services and the Wisconsin Upper Michigan Synod Board. Later in her life, she was active in health and human services in the area, as a mentor to women diagnosed with cancer and as a volunteer for the Red Cross. In 1993, shortly before her death, the Head Start Center in Ashland was dedicated in Sandin’s honor in recognition of her years of service to youth education. “Caroline Sandin Passes.” Ashland Daily Press, March 14, 1996. Murphy, Thomas H. (ed.) “The Board of Regents.” Wisconsin Alumnus. Vol. 70, Number 4 (Feb. 1969), pp. 10-13. http://digicoll.library.wisc.edu/cgi-bin/UW/UW-idx?type=turn&id=UW.v70i4&entity= UW.v70i4.p0012&isize=text.